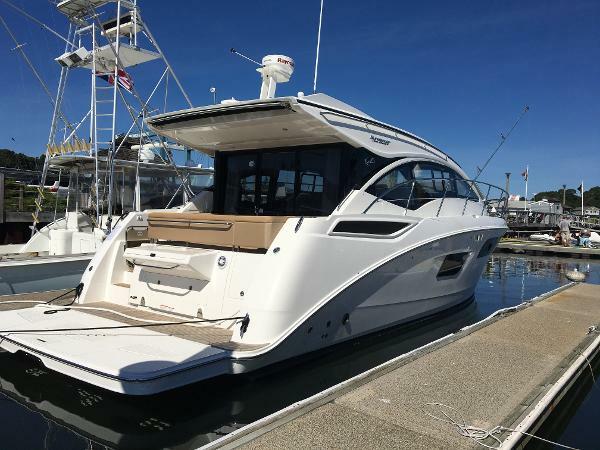 2017 Sea Ray Sundancer 400 Entertainment comes naturally on the Sundancer 400, with an open floorplan that creates generous, interconnected social zones throughout the boat. 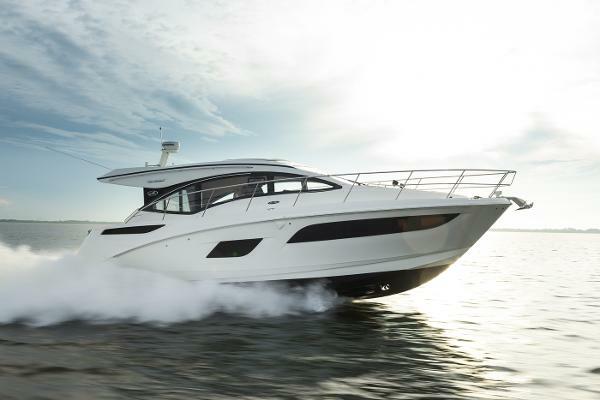 Large windows and a convenient sunroof, part of Sea Ray's SkyFlow Design philosophy, let in an abundance of natural light. Rich materials and finishes enhance aesthetics as well as comfort, while two full-beam staterooms invite you and your guests to relax, settle in and savor the full experience of life on the water. 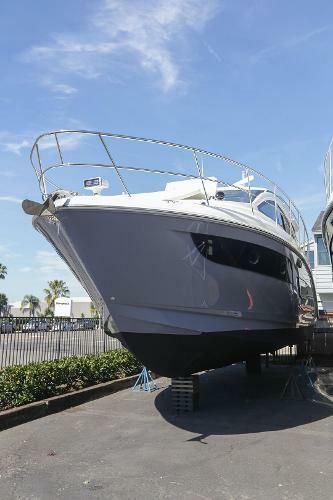 2017 Sea Ray Sundancer 400 2017 Sea Ray 400 Sundancer, Black hull, Black canvas, TVD QSB 6.7 480 T3 Non DTS Diesels, 120/240 Vac/60 cycle electrical system, Prestige cherry interior, LG genova solid surface countertops, Cockpit and platform teak flooring, Interior carpet runners, Opening portlights in every stateroom, Salon sofa with pull out bed, Second head in V-Berth, Aft stateroom storage cabinet, Wine cooler, Safe, Sirius satellite radio, Flatscreen TV with DVD in mid cabin, Macerator with seacock interlock system, Inverter, Foredeck sunshade, Foredeck audio system, Windshield with opening side windows port & stbd, Mesh windshield shade canvas, Electric retractable over cockpit awning, Transom gourmet space w/grill, Cockpit exterior stereo upgrade, Cockpit table teak finish with cover, Hydraulic swim platform, Hydraulic swim platform teak flooring, Rod holders, Transom underwater lighting, US flag, Dynamic running surface, Raymarine ES128 chartplotter/aux display, Open array radar, Raymarine autopilot, Raymarine fish finder, I/B joystick docking system bow & stern thrusters, Windlass - all chain, S/S anchor, Anchor wash down system, Fuel transfer pump, Oil changer system. 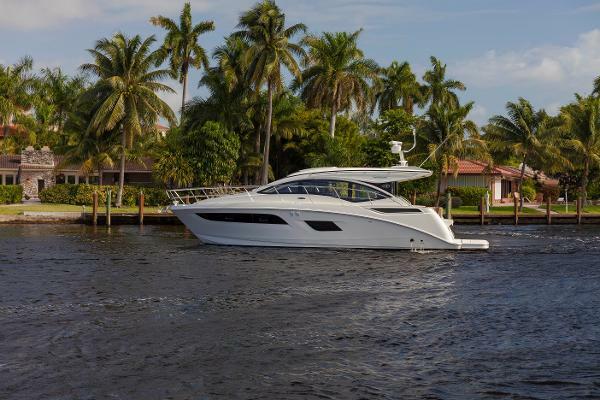 2017 Sea Ray Sundancer 400 Entertainment comes naturally on the Sundancer 400, with an open floorplan that creates generous, interconnected social zones throughout the boat. 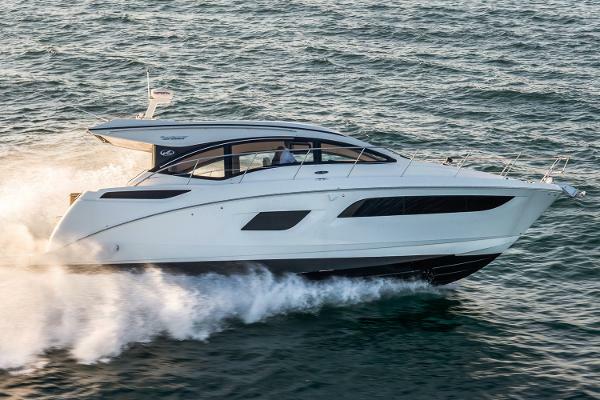 Large windows and a convenient sunroof, part of Sea Ray's SkyFlow Design™ philosophy, let in an abundance of natural light. 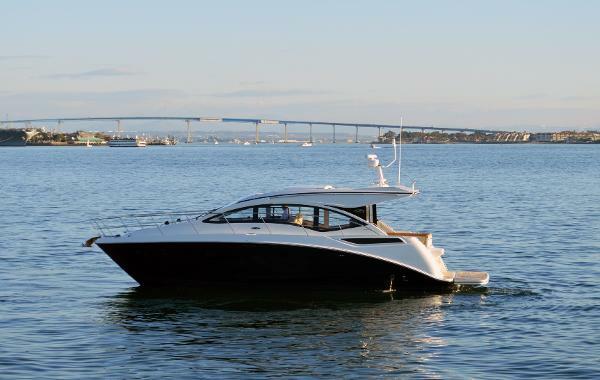 Rich materials and finishes enhance aesthetics as well as comfort, while two full-beam staterooms invite you and your guests to relax, settle in and savor the full experience of life on the water.